New Full-Cast Production from The Online Stage! Lee Ann had a great deal of fun participating in this humorous production from The Online Stage. Arcadian Adventures With The Idle Rich by Stephen Leacock is a series of vignettes illuminating the farcical activities of, well, the idle rich. “Stephen Leacock (1869-1944) may be considered the Canadian counterpart to Mark Twain. For many years he was professor of economics at Magill University and published a number of well-regarded texts on economics and political science. However, he is best known today for his many volumes of humorous fiction. During the 1920s he was one of the most widely read authors in the English-speaking world and was considered by Jack Benny and Groucho Marx to be one of the greatest comic writers of all time. In Arcadian Adventures with the Idle Rich, Leacock applies a satirical scalpel to the foibles and pretensions of the wealthy and the powerful. He not only probes the quirks of traditional power structures like corporations (public and private), political parties, universities, and churches but also finds time to poke fun at one of his favorite targets – the world of psychic phenomena. Cast: Lucullus Fyshe – Jeff Moon; Dr Boomer – Ron Altman; Fareforth Furlong – Richard Andrews; Mrs. Rasselyer-Brown – Lee Ann Howlett. Additional voices supplied by Bob Neufeld, Ben Stevens, P. J. Morgan, Brett Downey, Denis Daly, Andy Harrington, David Prickett, John Burlinson, Alan Weyman, Joseph Tabler, Susan Iannucci, Becca Maggie, Jennifer Fournier, Ted Wenskus, Leanne Yau, Arielle Lipshaw, and Marty Kris. To listen to a sample and/or purchase, check it out on Audible here. 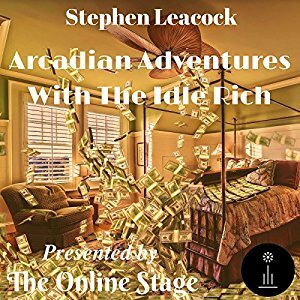 Posted by lahowlett on April 22, 2017 in Uncategorized and tagged Arcadian Adventures With The Idle Rich, Audible, audiobook, farce, full-cast production, humor, Stephen Leacock, The Online Stage.